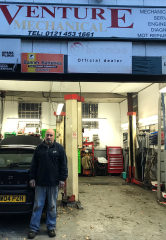 Venture Mechanical Ltd is a well-established independent garage based in Rubery, Birmingham, which has been in operation for over 40 years. We have built up a strong local reputation for providing excellent service to our customers – so much so that the vast majority of our business comes from repeat custom, which speaks volumes on how happy they must be with the service received. We carry out all forms of mechanical repairs, maintenance work, servicing and MOTs on all makes and models, with no job being too big or too small.